Tadcaster Albion were left frustrated after being held to a 1-1 draw by Brighouse Town in Evo-Stik Division One North. Josh Greening’s first-half strike cancelled out Luke Parkin’s opener, but the Brewers then squandered a number of clear opportunities to win the game as a lack of cutting edge once again proved costly. 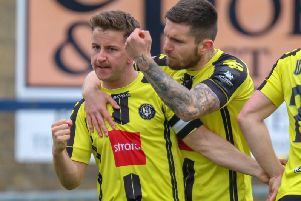 Having lost their two previous matches by a 1-0 scoreline, Taddy found theselves trailing as early as the fifth minute in Saturday’s encounter. Goalkeeper Gary Stevens originally punched a corner kick clear, but the ball was sent back into the box and headed across goal for Parkin to fire in acrobatically. This early setback seemed to spark Billy Miller’s men into life, however, as Rob Youhill came close to levelling things up just five minutes later, his 30-yard strike forcing visiting keeper Tom Taylor into a save. On 16 minutes, Youhill curled the perfect ball into an area behind Brighouse’s backline and Josh Greening cut inside Alex Low with ease and stroked past Taylor at his near post to level the scores. Adam Baker glided past two men before forcing Taylor into another save, diving low to his right and then Fatlum Ibrahimi volleyed straight at the Town stopper. Albion were well in the ascendancy by this point, but the sides went into half-time with the scores still level. Miller’s troops continued where they left off after the break and came within a whisker of taking the lead two minutes in when Gregg Anderson glanced Conor Sellars’ corner narrowly wide. Taddy remained on top but the away side still look threatening on the counter-attack. And they could have re-taken the lead 11 minutes after the re-start, but Stevens was quick off his line to block Thomas Dugdale’s shot. At the other end, Youhill slotted Baker in down the right-hand side and his shot on target was parried by Taylor before Youhill’s follow-up was belted off the line by Adam Field. Brighouse frontman Devonte Morton fed off scraps for most of the afternoon, but the towering forward almost capitalised on an error at the back, only for Stevens to recover well and push the ball to push to safety. The impressive Ibrahimi then shaved the crossbar with a fine left-footed effort from the edge of the area. Next, Josh Greening raced in behind the away defence, shifted onto his favourite left foot and set his sights on goal. But just as he pulled the trigger, the ball bobbled up, forcing the striker to fire off target. Home custodian Stevens was then quick to react once again, blocking substitute Jack Stockdill’s effort from just three yards out. Taddy’s best chance to nudge themselves in front came 11 minutes from time when substitute Liam Shepherd hung up a cross to Josh Greening who volleyed wide from just four yards out. There was to be one final opportunity in injury-time as Josh Grant’s crunching tackle saw the ball drop over the top of the visitors’ defence and into the path of Baker who raced through and struck low across goal, but Taylor got down and held on well.